What do you get the father that has everything? And needs nothing? How about an upgrade to his style? 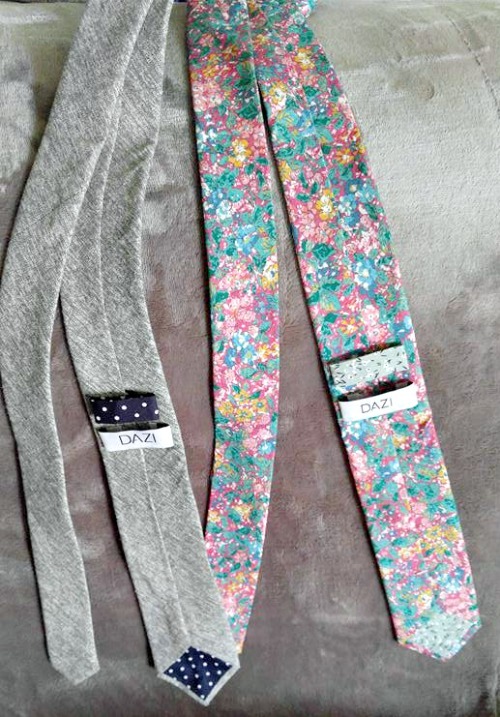 Because Dazi skinny ties will help you spruce dad up. And they have a section for boys – this way you can make the little one match Dad. Can you just see everyone’s face when you walk into the church and your guy’s match? Your family will be the talk of the service. And everyone will want to know where you bought your ties! I absolutely love this design! It is so colorful and festive adding personality and spice to any outfit! Perfect for any suit or dress shirt in his wardrobe. Dazi believes in offering you high-quality ties at an affordable price. Perfect for the man in your life that wants to elevate their outfits to the next level. All of their ties are handmade from high-quality imported fabrics. And they are approximately 2.5″ wide at the tip and 58″ in length. Which makes them perfect for men of all heights. Because my husband is 6’3 and we have trouble with some of his ties being too short and just not looking good. And each tie is lined with a fun and unique fabric that adds, even more, character to your ties and outfits. So head on over to their website and pick out the tie that you know your Dad and husband will love. Surprise them this Father’s Day with a unique and colorful tie.